Apologies if this has been debated before, i did look around and only found limited mentions on tyre choice. Personally i dont like the thin look of the stock tyres. I would probably want to go with 215/75/15. I will be driving around 70/30 70 on to 30 off road. I like the look of some tryes (KO2) but am awre they are bad on wet asphalt. AT3's are ok too, but i have found some others that might fit the bill. Toyo Country seem ok, there AT+ Plus seems a good comprimise, giving fairly agressive looks but with decent on-road ability. The M/T would be bad for on road, and the R/T seem to be inbetween AT and MT. In an ideal world i would love the KO2 with good on road ability, but this is clearly not the case. So i defer to you lovely lot for some guidance and recommendations. 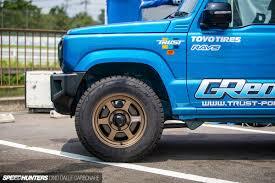 Replied by TomNewton on topic NEW Jimny TYRE choice discussion. I'm likely to go with the Toyo A/T+ when mine arrives next month so interested in this also. Not being able to stretch to BF they seem to be the best balance for me. Replied by cyberdriver on topic NEW Jimny TYRE choice discussion. 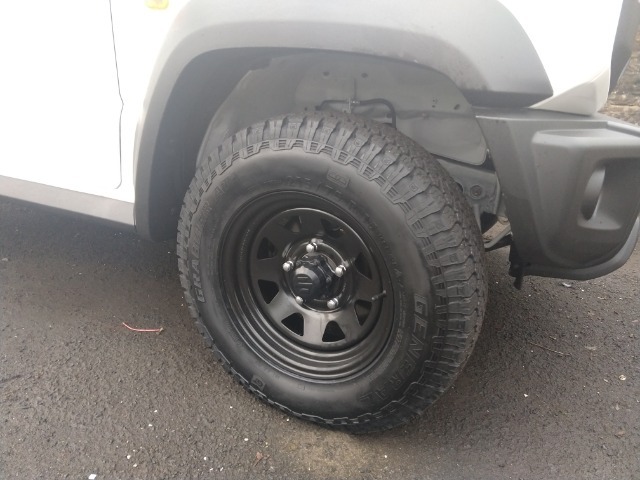 These tyres are built for big SUVs and a Jimny weighs next to nothing, so all other things being equal I would get the lightest tyre with the lowest load rating. Last time I looked that was Toyos. tiresize.com has the weights. 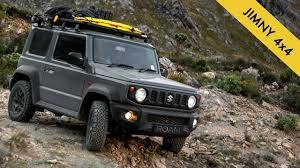 Replied by JustCallMeRick on topic NEW Jimny TYRE choice discussion. Als check out the hankook dynapro atm (rf10). Replied by Gadget on topic NEW Jimny TYRE choice discussion. I spent ages looking at different tyre options, which if I'm honest are an almost purely aesthetic choice, as I do little to no driving offroad. Whatever you choose in the larger size, you're likely to see slightly worse fuel economy (I reckon mine has dropped a couple of mpg) and potentially less ride comfort due to the higher load rating. 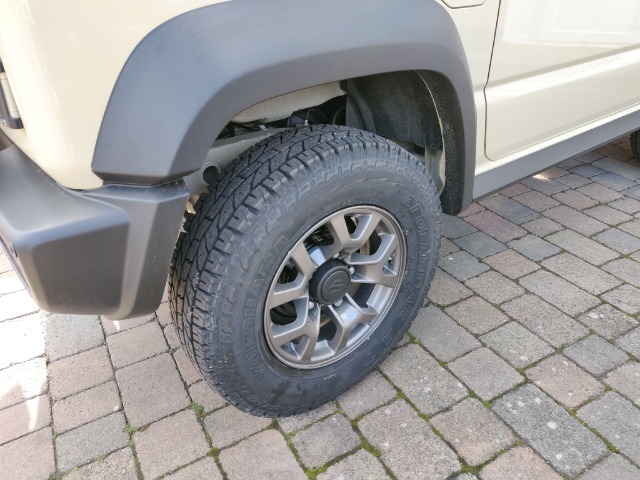 I went for Yokohama Geolandar A/T G015 in 215/75R15 and I'm really pleased with them, as they give it far more presence on the road without being OTT. Garage set pressure to 34-36psi, which I've dropped to 30 at the moment and the ride seems as good as it did beforehand. Debating dropping them lower but they already look fairly soft with an even contact patch. 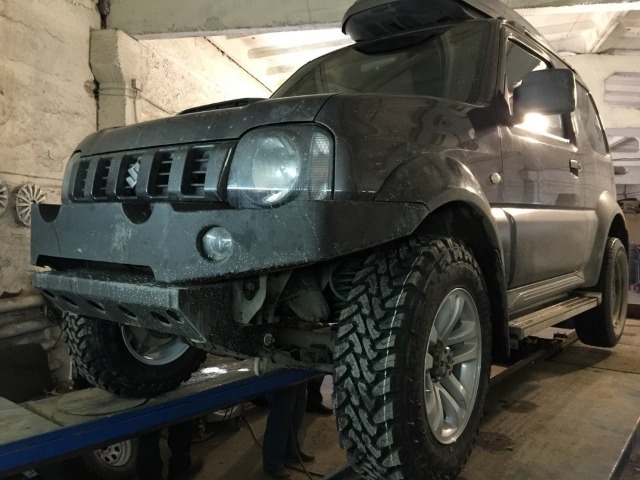 Replied by Busta on topic NEW Jimny TYRE choice discussion. Gadget- 30 still sounds very high. I run 21psi in my same-sized BFGoodrich. With a larger volume tyre you expect to run lower pressures, so I'd certainly not have them any higher than the standard tyres. Given the cars are so similar, suitable tyres will be no different to those widely discussed for the gen3. 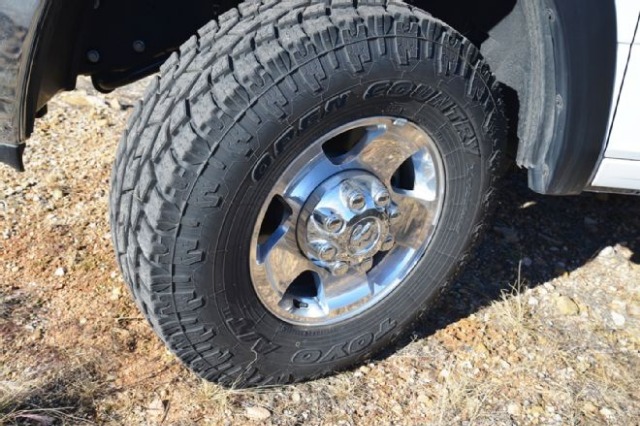 BFG All- and Mud-terrains, Yokohama Geolanders, Goodyear Wranglers, Toyo Open Country, Kumho KL71s all offer different levels of aggressiveness and cover a variety of price points. Sizing wise, 195/80r15 or 215/75r15 will preserve good road manners and keep gearing standard. However, looking at pictures there's a good chance 235/75r15s will fit without issue. 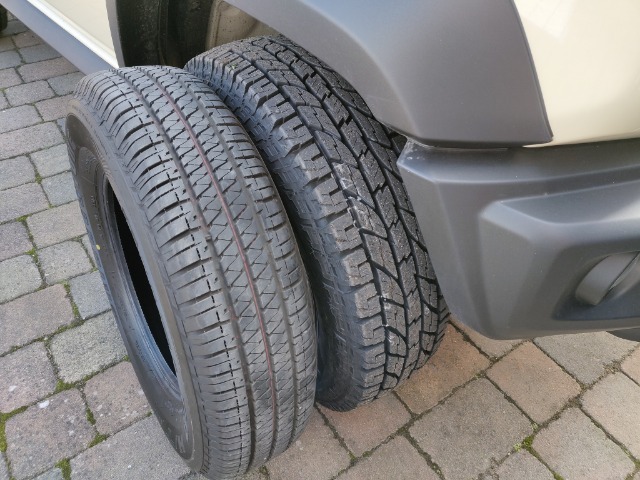 They are a much more popular tyre size amongst 4x4s which opens up a wider choice of tyres, often cheaper than their smaller equivalents. 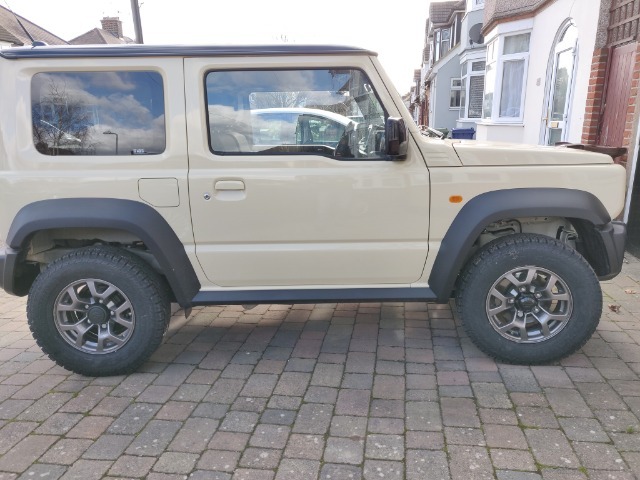 Replied by Andy2640 on topic NEW Jimny TYRE choice discussion. TomNewton wrote: I'm likely to go with the Toyo A/T+ when mine arrives next month so interested in this also. Not being able to stretch to BF they seem to be the best balance for me. Yeah i really liked the prospect of these Toyo AT plus's, but on a picky and rather silly note, they have a moulding line that runs right around the tyre wall. Call me silly but im not sure I like the look of it. Here is a piccy. Might overlook it though, as they seem to be a great balanced tyre. Gadget wrote: I spent ages looking at different tyre options, which if I'm honest are an almost purely aesthetic choice, as I do little to no driving offroad. Whatever you choose in the larger size, you're likely to see slightly worse fuel economy (I reckon mine has dropped a couple of mpg) and potentially less ride comfort due to the higher load rating. Very nice! Havnt seen these before. I like these ALOT. Thx. Busta wrote: Gadget- 30 still sounds very high. I run 21psi in my same-sized BFGoodrich. With a larger volume tyre you expect to run lower pressures, so I'd certainly not have them any higher than the standard tyres. I'd love the 235's!!! Very cool prospect. However wont they take the Jim over the 5% warranty rule? Sorry im naff with maths. 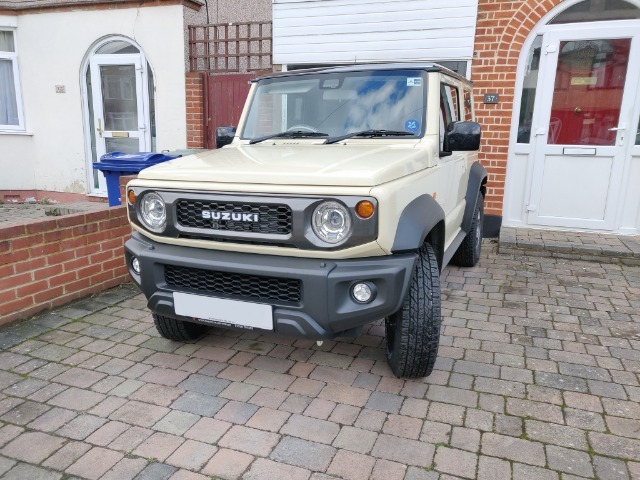 Replied by Dorsetdumpling on topic NEW Jimny TYRE choice discussion. Great looking tyre, but where did you get them from? I’ve looked around but can’t find a source for this size? Even the Yokohoma site doesn’t seem to list them in this size. I got mine from blackcircles.com, but bizarrely they don't seem to list them any longer - I only got them on Thursday!